The token soared following the announcement of the launch of IOTA's new data marketplace. Over the last few weeks the cryptocurrency market has been soaring. Bitcoin is trading strongly above $11,500, and investors are also getting an excellent return from many altcoins. But when it comes to MIOTA, the craze is on another level. 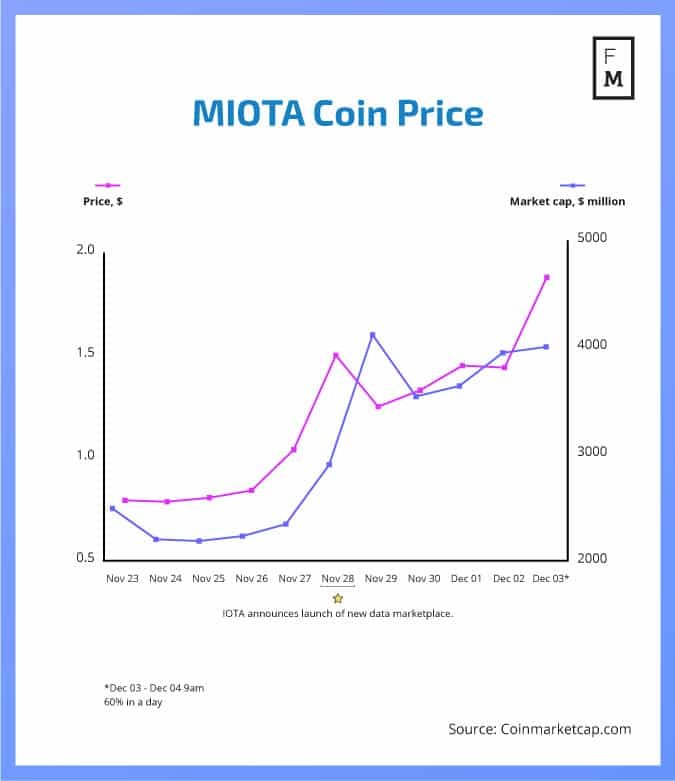 In the last 24 hours, MIOTA, the token introduced by the IOTA organization, has gained 70 percent and reached above $2.50. The meteoric rise of the coin places it in 5th spot in the list of the largest coins, overtaking DASH, Bitcoin Gold and Litecoin. The market cap of this coin has reached a record $6.9 billion. The coin also gained over 200 percent week-on-week, and in the past month it appreciated more than 700 percent overall. With these bullish movements, analysts are expecting the MIOTA price to break $3. A huge chunk of the boost is coming from the concentrated South Korean market. Though Bitfinex is the leader in handling IOTA tradings with 46 percent in the last 24 hours, around 35 percent of the trading is done on Coinone and Binance. IOTA is trying to be a dominant player in the blockchain market by handling the data. Recently the organization announced a partnership with more than 20 companies, including giants like Microsoft and Fujitsu, to launch a new data marketplace. This announcement also boosted MITOA’s price as crypto investors see strong potential in the IOTA platform. Since its introduction in June 2016, IOTA has addressed the shortcomings of the Bitcoin blockchain. The biggest appeal of IOTA is its Tangle network. With this technology, the firm is claiming an “infinitely scalable” network, and this will add to the fee-less transactions on the platform. Also, IOTA is betting on the gradually rising Internet of Things market. The data in the IOTA network will also give the organization leverage in the tech community developing IoT based products. By 2020, it is expected that more than 50 billion devices will be connected by the internet and IOTA predicts that this number will go up to 75 billion in the next decade.